Any income or earnings statements are estimates of income potential only, and there is no assurance that your earnings will match the figures we present. Your reliance on the figures we present is at your own risk. Any income or earnings depicted are NOT to be interpreted as common, typical, expected, or normal for the average student. 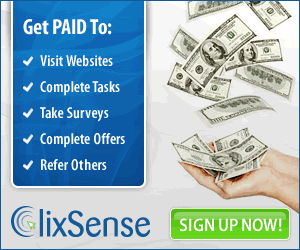 This particular result may be exceptional, and the variables that impact results are so numerous and sometimes uncontrollable, that ClixsenseSuccess makes no guarantees as to your income or earnings of any kind, at any time. Make Money Online businesses and earnings derived therefrom, have unknown risks involved, and are not suitable for everyone. Making decisions based on any information presented in our programs, products, services or on our website, should be done only with the knowledge that you could experience significant losses, or make no money at all. Only risk capital should be used.